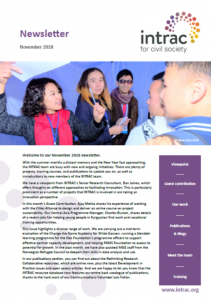 As 2018 draws to a close, we have a lot to share with you, including a viewpoint from Dan James, which offers thoughts on different approaches to facilitating innovation and a guest contribution by Ajay Mehta who shares his experience of working with the Cities Alliance to design and deliver an online course on Project Sustainability. We have updates on our recent work with a variety of organisations, and our publications section has details of new resources from the Rethinking Research Collaborative. Plus, the latest issues of Development in Practice. And finally, we have information on all of our upcoming training courses and introduce you to the newest members of the INTRAC team. Newly Updated Resource Database - Now Includes The Entire Catalogue Of Publications!